People who like to keep pet fish at their home always love to have Jack Dempseys which is quite easy to look after. This fish is very colourful and is easily available in the market. But one of the most alarming things about Jack Dempseys is that they are aggressive and can cause harm to each other while living together. This is the only thing that can create trouble for you especially when you want to breed Jack Dempseys in your aquarium at home. But it does not mean that it will be difficult to get positive results as you just need to do certain things which will make the breeding process smooth. Breeding Jack Dempseys is not difficult for those people who have detailed knowledge and fulfil all requirements to provide a better environment. Only those people fail to achieve good results who ignore many important aspects that play a major role in breeding. However, if you love to keep Jack Dempseys in your home and also want to breed them, then you can take guidance from this article which will give you all basic details that will help you in this regard. You should have three tanks or aquariums in your home. You should have them bubbling for almost four weeks before putting in Jack Dempseys. Put the male in one tank and female in the second tank. Then you should maintain the temperature of the tanks between 76 to 82 degrees Fahrenheit which is quite suitable for breeding Jack Dempseys. Make sure you have a couple of Jack Dempseys and their size should be close to each other. It will help in breeding and you will get maximum result. You should provide protein rich food for the couple which will prepare their bodies for the stress of spawning. The cichlid pellets, night crawler and a pinch of hamburger serve best in this regard. Then put a flowerpot or slate in the tank that you want to use for breeding. A foam should also be over filter opening of the aquarium which will save the tiny fish, also called fry, from getting pulled into the filter. Now, you should put both, male and female, in the similar tank. If they start fighting with each other, they will not have mating. However, if they show calm behaviour then the breeding process will become smooth. Jack Dempseys do not eat their eggs, so leaving the couple alone will not cause any damage. Their eggs will take two to three days in hatching. 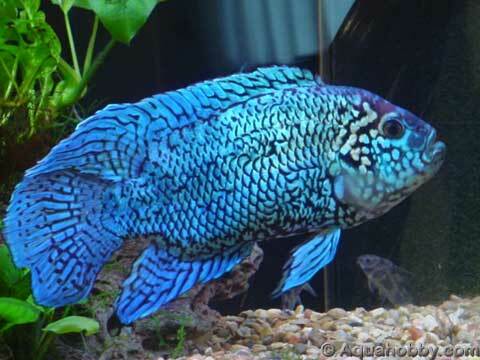 In starting days of fry, try to feed them with freshwater fish flakes, micro worms and cichlid. When you observe that these babies become 1/2 inch long, immediately remove them into another tank.